Page Street Publishing, 9781624145520, 224pp. Craig Caudill, author of Extreme Wilderness Survival and chief instructor at Nature Reliance School, takes you to the cutting edge of outdoor gear. Find out which items will perform the best in the field without breaking the bank. Learn what you need, why you need it and how to care for it. Craig lets you in on his favorite tried-and-true brands and shares dependable items tailored to your specific environment. Gearheads will love this in-depth analysis of knives, cordage, fire starters and fuel, water purifiers and containers, packs, compasses and maps, first-aid items, clothing, tents and sleeping bags and so much more. With nearly five decades of wilderness experiences, Craig has seen almost everything nature can throw at you, and he has become a distinguished wilderness skills teacher, survival guru and seasoned outdoorsman. 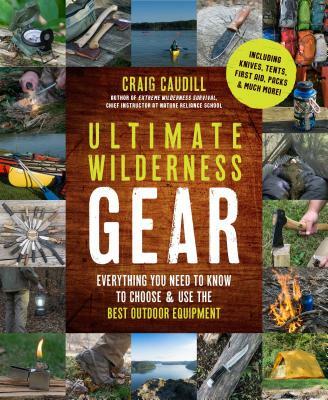 Full of tales straight from Craig’s own adventures and tips from trusted wilderness experts, this is more than an essential gear guide; it’s an unparalleled wilderness advisor and companion. Craig Caudill is the author of Extreme Wilderness Survival and chief instructor at of Nature Reliance School. He has taught wilderness safety and backcountry skills courses for the Department of Defense, federal law enforcement and thousands in the public sector. He has written for American Frontiersman, Self-Reliance Illustrated, Backwoodsman and Wilderness Way. He lives in central Kentucky.